The Ballad of Gay Tony introduces seven new, military-grade, weapons, and also introduces the parachute to the GTA IV era. The weapons from Grand Theft Auto IV are still available; the Grenade Launcher is the only weapon to return from The Lost and Damned, with minor changes; its grenades have a shorter fuse and explode on impact with people and vehicles. 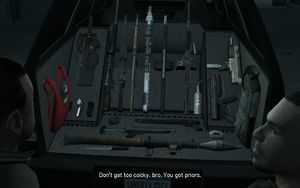 Like The Lost and Damned, the new weapons can only either be purchased from Armando Torres' Cavalcade or spawned at Luis' apartment after completing a certain number of Drug Wars. Unlike TLAD however, the player can also acquire the new weapons by inputting the "Advanced Weapons Set" cheat code. Explosives used to tag vehicles or objects for remote detonation. Unlike the Satchel Charges in Grand Theft Auto: San Andreas, these bombs don't stick to people. An explosive charge detonates when the player press down on the d-pad or shoots the charge. Also, a short while after a sticky bomb is placed, it will explode on its own if not detonated or shot at. However, in online multiplayer, a player can shoot another player's already thrown bomb and it will instead disappear. After completing 40 Drug Wars, some are sent to Luis' apartment. They pack the explosive punch of a Pipe Bomb, but with the ability to stick to vehicles, buildings, etc. A new type of handgun. It is a high velocity handgun for quick and accurate kills. Using the .44 Magnum cartridge, it is more powerful and accurate than the Combat Pistol, however the Pistol .44 has the lowest rate of fire of any handgun, and takes longer to reload. After 10 Drug Wars, one is sent to Luis' apartment. A Gold-plated SMG. Yusuf Amir is often seen carrying this weapon. It is given to the player alongside Yusuf's Super Drop Diamond as a reward for completing all of his missions. It can also be purchased from Armando after unlocking it. The weapon has a high rate of fire and superior stopping power compared to other SMGs; however it is less accurate because Luis fires it from the hip. After completing 50 Drug Wars, one is sent to Luis' apartment. A light, accurate, silenced and compact sub-machine gun. The weapon's 50-round magazine and accuracy makes it a good ground combat weapon; however, the weapon has less stopping power than the standard SMG and takes longer to reload. Unlike other SMGs, the Assault SMG cannot be used in cars without either a glitch or hack. Several NOOSE and FIB officers carry the Assault SMG rather than the SMG or Carbine Rifle. A low recoil automatic shotgun with semi-auto fire to take down multiple targets easily. It uses either standard shotgun shells, or special explosive rounds (based on the Frag-12 explosive shell) which destroy almost any target. Standard shells are red whereas explosive rounds have a green casing. The Tactical Response Unit of NOOSE and the FIB use the Auto Shotgun with standard shells in place of the Pump Shotgun. After completing 30 drug wars, one with explosive cartridges is sent to Luis' apartment. NOTE: If the player switches from the Automatic Shotgun to either the Pump Shotgun or Combat Shotgun, the player loses any extra shells beyond 80. Also, if the player switches between explosive rounds and standard shells, the player loses all units of the previous ammunition type. A powerful weapon that fires 900 rounds per minute, taking enemies down fast. The Advanced MG is placed in the Assault Rifle slot since it uses 5.56x45mm NATO rounds. The weapon's magazine capacity and rate of fire makes it perfect for engaging multiple enemies; however, it has less stopping power than either assault rifle, is less accurate due to the weapon being fired from the hip, and has a longer reload time due to its belt-fed design. LCPD and NOOSE officers in The Ballad of Gay Tony use the Advanced MG from helicopters instead of the Carbine Rifle. After completing 20 drug wars, one is sent to Luis' apartment. Greatly increased range, rate of fire and sniper zoom make this the ideal long range weapon. Like the Automatic Shotgun, it can use either standard or explosive rounds, however explosive rounds are only available in multiplayer or single player with a cheat code. The explosive rounds have the explosive capability of a grenade in single player. In multiplayer, however, the explosive rounds are only as effective as Explosive Shotgun shells. The Parachute returns in The Ballad of Gay Tony. Its steering system is the same as in San Andreas. It is first used in High Dive, and in parachute checkpoints. The parachute is automatically, infinitely available in multiplayer. This page was last modified on 28 January 2013, at 21:51.